Two days ago is my nineteenth birthday and it is also my first birthday in Melbourne. Because the majority of my friends are busy with their part-time job during the holidays and some others went back to their own country, no one was able to hang out with me. Therefore, I decided to go to Glen Waverley, which is one of the suburbs in Melbourne, for finding the restaurant to celebrate my birthday. 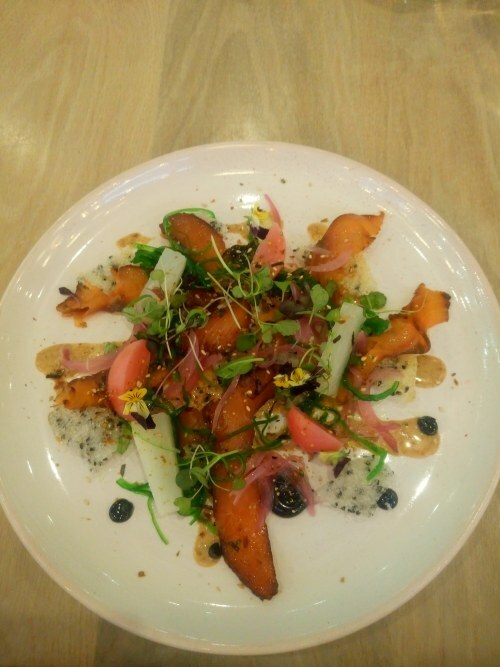 There are a lot of bistros with various cuisines in Glen Waverley, including Chinese, Vietnamese, Indian, Hongkongese, Thai, and Western cuisines. After a half hour of finding the bistro for a bite to eat, I, fortunately, figured out the White MoJo restaurant. This restaurant is located on Kingsway Street, Glen Waverley. 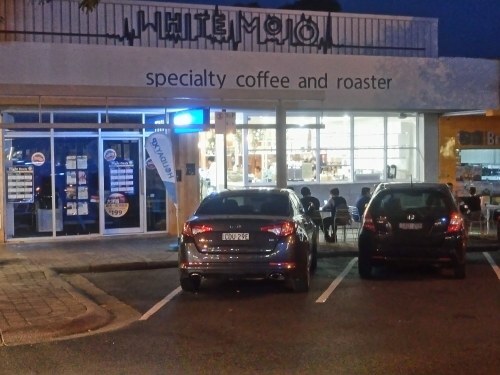 Additionally, White MoJo also has two other branches, including on Hardware Street, Melbourne, and on White Horse Street, Balwyn. The restaurant serves meals, beverages, and desserts. This is a good business model because it is possible to serve various kinds of customers in both day and night time by serving breakfast, lunch, and dinner. Moreover, it not only is possible for customers to have a meal here but they can also take food away after paying a bill.On the other hand, from what I have searched on the Internet, the restaurant is famous for coffee beverages, and desserts. After having a meal here, I considered that it deserved to receive 4 in 5 stars overall. Now, I am going to share my experience. 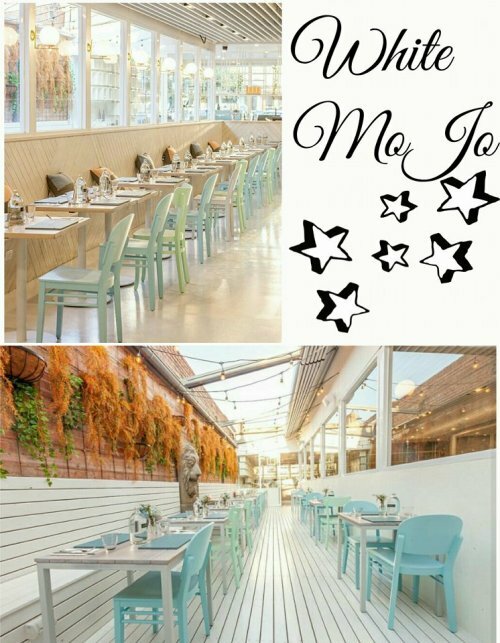 When I went to White MoJo restaurant, I was impressed by its space and design. First of all, the restaurant is extensive inside that is possible to serve a meal for single people, couples, and family. Moreover, it also has rooms for celebrating parties such as birthday party, or weekend party. On the other hand, chairs and tables are arranged smartly for all kinds of customers and for maximizing the number of customers every single day. The arrangement of chairs and tables with the romantic and lovely decoration by using glass globe string lights and artificial plants is the perfect combination, resulting in its gorgeous Australian design. This design made me comfortable when having a meal for dinner. In my opinion, it is the combination of restaurant and coffee shop model. Besides that, the restaurant also has space outside. It is used for customers who take food away or take a seat for a cup of coffee. This is a Coffee Cured Salmon dish, which I ordered for my birthday. I considered that its decoration was perfect due to the balance of color by using the green of herbs, red of dehydrated onion, sepia of salmon and avocado tahini, black of sesame, and white of sesame rice crisp. Moreover, the dish had both great smell and taste. When I tasted the salmon, its taste was slightly salty – I thought because of the avocado tahini, but it did not smell fishy. Additionally, the sour taste of dehydrated onion and the taste of herbs combined with the slightly salty taste of salmon that made the dish were delicious. Although it was the coffee salmon dish, I felt there was no coffee taste when tasting it. On the other hand, I think its price (19 AUD) is affordable. It took me 25 minutes to have a dessert, namely MoJo Matcha Mess. However, it deserved my wait because MMM was tasty. Its decoration was good because I thought that other desserts were more outstanding than MMM. In my view, it was like the Western decoration. Additionally, its taste and smell were great. For example, matcha cream was so sweet at the first time I tasted it. However, its taste was delicious when I ate matcha cream and black latte sponge at the same time. 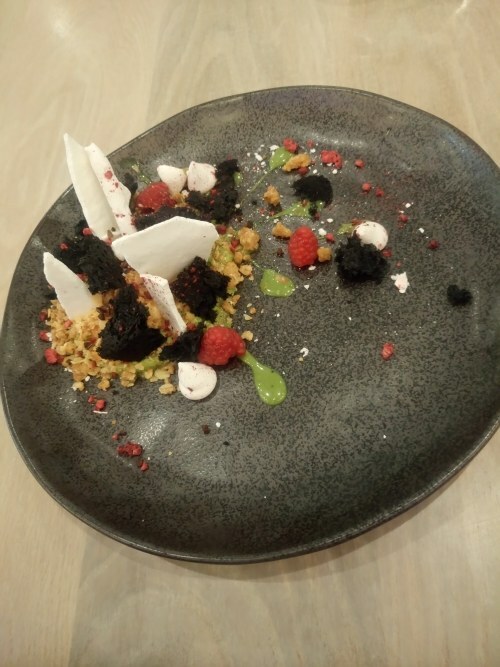 Moreover, the matcha cream, meringue, fresh strawberry, and oat crumble made the dessert tasty when I ate them together. The dessert also has raspberry coulis, but I do not recommend to eat matcha cream and raspberry coulis together because the sour and flavor of raspberry are possible to get the loss of matcha flavor. In my view, it is possible to eat raspberry coulis and meringue together because of the compound of the sour of raspberry and the sweet of meringue. On the other hand, its price (19 AUD) is affordable because of its both decoration and flavor. The restaurant has a great staff who make customers feel comfortable to have a meal here. Waiting time for food was not long (about 15 minutes), but I had to wait 25 minutes for the dessert after finishing my dish – it was quite long to wait. The manager was able to make a small talk to customers when serving a meal but it still made customers in the comfort zone. Moreover, he/she could make the staff feel comfortable and convenient to work together. There is all of my experience on the White MoJo restaurant. I think it is the perfect place for you to go whether you are the coffee addiction, or you are a big fan of sweet food. I ensure that you will intend to go more times again after visiting it for the first time. Hi Sophie! Thank you for reading this post and leaving a comment. I think your wish will come true soon. Anyway, if you have a chance, let’s try going to Melbourne so that you can visit many beautiful restaurants here. P/s: I guess you live in Britain, right?